I've pulled together some of my favourite 'boredom busters' - guaranteed to keep our dogs occupied and far from bored! It's often said that a tired dog is a happy dog,. The ideas in this ebook will certainly help tax your dog's grey matter and lead to a tired and happy hound. This e-booklet is packed full of ideas that will help keep your dog occupied and happy. Why not give them a try a today? 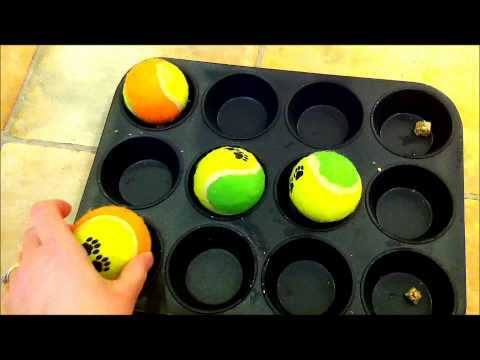 The muffin tin game is a fun way for your dog to use their brain and is an inexpensive interactive toy/game. First get your dog used to getting a food treat from the muffin tin, by dropping in a food reward into each well and then allowing your dog to eat the reward. Do this several times, to make sure your dog is happy with placing their nose in the tin. Then, cover 2 or 3 of the food rewards with a tennis ball or a piece of scrunched up paper. Encourage your dog to use their nose and paws to dislodge the balls to reveal and eat the food rewards. When your dog is readily removing 2-3 tennis balls, then cover all the wells with a tennis ball. ​My greyhound, Mina, used to love the muffin tin game. You can see her in action in the video below. Making a ‘lucky dip’ box is an inexpensive and easy way to provide your dog with mental stimulation. If your dog likes to destroy items, providing them with a number of items that they can safely destroy and have fun destroying - such as cardboard boxes (with any staples removed), the cardboard inside of kitchen roll/toilet roll, old newspapers etc – will help preserve your belongings. Making a ‘lucky dip’ box is easy and provides a great outlet for your dog. Take a suitable box and within it, place a stuffed Kong®, a few chews, a favourite toy, and bits of kibble, raw carrot – whatever your dog likes to eat. Putting a chew inside the inside of an old kitchen roll tube, wrapping a toy in several sheets of newspaper…the contents are only limited by your imagination and what is safe to destroy. Your dog will then have to use both mental and physical energy to empty the box and should enjoy (calmly) eating a chew or Kong® at the end of it. You will have some clearing up to do, but it is better to clean up items you have provided your dog to destroy, rather than those you haven’t! There are lots of ways you can turn mealtimes into a fun activity or training time for your dog. Turn mealtimes into a time when your dog has to work for their food. There are so many different games and food puzzles that you can offer a different activity every day of the week if you wish! This helps to keep your dog mentally stimulated, teaches them how to problem solve and gives them confidence to try new things. Treat balls that are designed to be rolled around for the kibble to come out. Kong® Wobbler which is an interactive food toy that sits upright until it is pushed by your dog’s paw or nose, and then dispenses treats as it wobbles, spins and rolls. Snuffle mats, as the name suggests, are a great way for your dog to ‘snuffle’ out their food. They are generally made from a rubber mat which is intertwined with fleece strips, and your dog sniffs to find the dry food which is hidden between the fleece strips. Nina Ottosson games which encourage your dog to work our puzzles to release the food. If you feed your dog wet food there are several rubber toys that are designed to be stuffed with food and extend meal times, or provide a ‘boredom buster’ for your dog. One of the most well-known of these is the Kong® Classic. The Kong® Classic is made of durable rubber and can be stuffed with a variety of food types. The ingredients for a stuffed Kong® are only limited by your imagination and what your dog likes to eat! Remember to ensure that any foods you use are safe for dogs to eat. Once your dog is comfortable using a Kong®, you can even progress to freezing the contents, which means it takes your dog longer to eat them. Rather than feeding out of a bowl, turn mealtimes into a ‘hide, scent & eat’ game? You can scatter kibble in the garden and encourage your dog to find their meal. The dog’s nose is amazing and hundreds of thousands times more sensitive than our sense of smell. Scent work is great way for our dogs to engage their brains and use their greatest sense. Scent work can be enjoyed by every dog – no matter what their breed or age. Introducing your dog to the ‘find it’ game is an easy way to start scent work, and you can start your dog off with searching for cheese! Once your dog is happy with the ‘find it’ game, you can start to vary it by hiding the cheese in places where your dog will need to sniff it out. Training bonus: Playing ‘find it’ increases the reliability of recalls, as the ‘find it’ game can’t continue unless your dog comes back to you, before you throw another piece of cheese. If you have a dog who likes to dig up your flower beds, a digging pit is a useful tool to help manage your dog’s attempts at excavation. Digging is a natural activity for many dogs but it is not fun when your garden has become like a lunar landscape. Rather than try to stop your dog digging – if you do this, it is likely that another and equally unwanted behaviour will take its place – provide them with a dedicated space that they can dig in. A digging pit can be a corner of your garden or an old sand-pit that is designated as your dog’s digging spot. Fill the area with soil (avoid sand, as it’s likely to attract the local cats as a communal litter tray) and hide some rubber toys, chews or bones in the soil. Bring your dog into the garden, take them to the digging pit and encourage them to dig.